I have a love for all things Science Fiction. Whether it be a good book, movie, tv show, board game, you name it – I am hooked. When my sister said that I could guest blog for her sometime, I don’t think this was exactly the topic she had in mind, but it’s the first topic that came to my mind. And once the gears started turning, I couldn’t stop. I had my list of top Sci-Fi shows written down literally within a few minutes and ran with it. So I am happy to share with you, my top ten favorite Sci-Fi television shows. 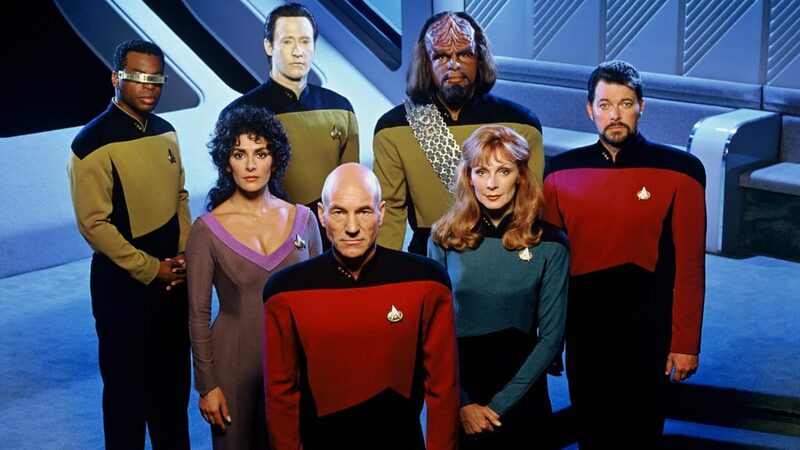 It’s hard to only list a few reasons why TNG is one of my favorite Sci-Fi shows of all time. The cast is one big happy family which I absolutely love, and there is such a good mix of science fiction, space travel, comedy, and character development. And I cannot fail to mention how dreamy Commander Riker is. Second season got a whole lot better when he came back with that handsome beard. A few of my favorite episodes to make sure you tune into: The Inner Light, The Naked Now, Captain’s Holiday, and anything with Q. If you haven’t yet seen Star Trek: The Next Generation, please stop what you are doing and start watching. It will be time well spent. I stumbled across Eureka when I found it on Netflix a couple years ago and it quickly became one of my favorite science-fiction TV shows. It follows Jack Carter and his daughter who get stuck in the town of Eureka. The town has the world’s smartest people living there and they build all sorts of inventions for the government. Picture the town of Mayberry and combine it with the Twilight Zone and you will have the wild, cozy little town of Eureka. Firefly is a like a western set in space. I still to this day do not understand why or how it was canceled but at least we have one season of pure goodness to enjoy over and over. Plus a bonus movie, Serenity, at the end to finish off the story. I’m still holding out hope that there will be A Firefly reunion sometime in my lifetime. I discovered Warehouse 13 after I watched Eureka and was needing a new show to binge watch. It’s a very quirky show and similar in nature to Eureka. The show follows secret service agents who are assigned to a remote location so they can find supernatural objects that have been lost or misplaced. One of the main characters, Pete Lattimer, gives the show a very pleasant comedic depth. This SyFy Channel show follows James Cole who travels back in time to try and prevent a plague from destroying all of civilization. Normally I despise time travel but this show executes it extremely well. The second season just wrapped up and we finally found out who The Witness is. Season three will not start until 2017 so we have quite a long ways to wait but if you have not seen the show it gives you time to get caught up so you can start watching at season three in the new year. The TV show that made me interested in all other Sci Fi shows and movies. When I was younger I used to be scared to death of this show. I’m not sure what changed or when, but I think I have seen every episode a few times now. The story lines are so creative – it goes to show that a well written and executed television show can stand up regardless of how long ago it first aired. Technically The Guild isn’t a TV show, but is a web series. And technically it’s not really Sci-FI, but it made my list anyway. I found it on Netflix and watched the entire thing in a day since the episodes are so short. It follows a group of people in the same guild, The Knights of Good, who play an online game together. It’s completely ridiculous and hilarious – I would recommend giving it a try even if you aren’t a gamer. I don’t think a top science fiction TV show list would be complete without Doctor Who on it. I started watching Doctor Who with the Rose Tyler episodes and was hooked. The classic episodes are still on my list to watch and can’t wait to start those. I am almost ashamed to admit that I just started watching this series a week ago since it’s always been such a popular Sci-Fi show. I binge watched the entire mini series AND season one in a weekend (don’t judge) and am just starting season two. I have been enjoying it so much that I decided to add it to the list. Dark Matter is a new show that airs on the Syfy channel on Friday nights. The show follows a crew of criminals who wake up one day to find that all of their memories are erased and they cannot remember who they are or what their pass entailed. The show is a bit more serious than a lot of the other science-fiction shows I like to watch but I still find it very enjoyable. So far I enjoyed first season better than I am getting into season two but there are still a lot of episodes to come so we will stay tuned. There you have it! My top 10 Sci-Fi TV show list. I am always looking for new shows to watch, so I would love to hear any suggestions of shows you have enjoyed. Thanks for reading! Lisa Hamm is Marie’s sister and BFF. 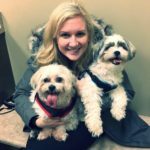 She lives in Iowa with her hubby and two fur babies, Cooper and Riker. Lisa enjoys dogs, nature, reading, eating, coffee, old movies, musicals, and (obviously) all things Sci-Fi.